If you get your horse used to movement from the fence (movement above him) you’ll see the difference in your first ride, and even some “broke horses.” Chances are, your horse/colt is not going to think to highly of you being up above him the first few times. So as with anything you do around a horse, go slow! Don’t overexpose him (to much, to quick) or you’ll really have trouble – both now and down the road. With the horse haltered on a long lead rope, climb up on the fence. 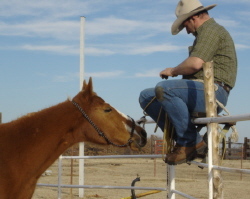 You’ll want to have your horse good at the foundation stuff first – (flexing/bending, backing, getting his hindquarters, leading up free) before you try this. Ask him to come up to you. You’d be surprised at how many older “broke” horses won’t do this! If you got him leading up free be patient, reward the slightest try and he’ll come on up there to you. When he does, pet on him and let him know he’s right. If it takes a while to get to this, that’s probably enough for now – there’s always tomorrow. Always operate with feel. When he gets pretty good at this, throw a little movement in there. You don’t want to just go swinging like a prizefighter right off – start slow. Pretty soon your horse won’t care if you’re up there swinging like a windmill. 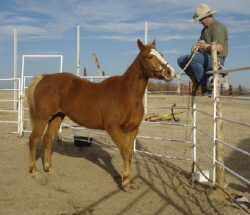 For more about how to get your horse used to movement from the fence, please contact us.